Maslenitsa is one of the warmest holidays that symbolize the arrival of spring. Everyone knows that on Maslenitsa you need to bake and eat blini and burn an effigy. But whether it was celebrated by our ancestors since ancient times in Russia? What is a blini and why you need to eat it? And why burn poor Scarecrow? Russian blini was not easy farinaceous product it is a symbol of light and sun. It is round like the sun and it represents the triumph of warm over cold. To cook blinis each hostess were especially responsible, in any case were not allowed to pass the family recipe blinis anyone but daughters. It was believed that if you give the recipe - welfare leaving families. But we despite this tradition, of course, will give you our best recipe Blini for Russian maslenitsa! On the last day of Maslenitsa people brought blinis to the cemetery, to the graves of deceased loved ones. Thus, people asked for forgiveness for their transgressions of the deceased. If after three days, from blinis there was nothing, it meant that the person forgiven. More close and understandable to us in the Maslenitsa fun, some of which we have now. For example, riding with high ice mountains. Here only earlier it was not easy entertainment occupation, but carried a deeper meaning. People believed that the deeper they slide, the better and greater the harvest. Bear fun was a favorite pastime of all segments of the population. Nowhere in the maslenitsa week is not complete without this. The bears were very respectful, as it was believed that the bear possesses mystical power capable to drive away misfortune. Usually bear show consisted of dance performances under the jokes of the leader, and in the end were fighting a bear with his master. It was as if affirming the power of man. Foreigners came in complete bewilderment looking at such celebrations. Naturally, they thought it was wild and primitive behavior. 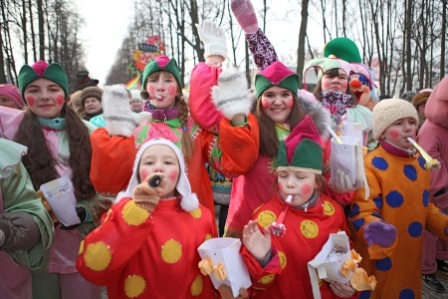 But maslenitsa was celebrated not only in Russia, also being celebrated Finns, Poles, Yugoslavs and Scots. The current generation might not fight with the bear, and the weather does not always allow us to ride a roller coaster in the maslenitsa, but we still love the traditions of our ancestors. How to celebrate maslenitsa in our days? Every person has the word "Maslenitsa" evokes positive emotions. Everyone knows that at this time, all having fun, seeing off the winter and bake a large number of blinis. It's not all of the attributes of carnival. In all regions Maslenitsa begin to prepare for the week. Many would call this training strange. Small children ran through the village and asked all the sandals - lapti. Gave only old lapti, new cherished. With these lapti children fled to the road on which the adults were coming from the city with shopping. The kids asked counter man: "do you bring Maslenitsa?" If the answer was negative, the children tried to beat an adult with sandals. Well, beat – it loudly. Of course, it was all in jest. On Sunday before carnival people must go visiting or receive visitors at home. On this day you can eat meat. The rest of the week before the carnival there was not meat. Maslenitsa is a merry holiday of the Slavs, which were inherited from pagan ancestors. This festival symbolizes the onset of spring and farewell to winter. Over time, pagan traditions are tightly intertwined with the Christian religion, and now Maslenitsa is celebrated 7 weeks before Easter, during the week before lent (Lent). An integral attribute of celebration are blinis, that's why Maslenitsa is also called "blini week". Blini - Russian pancakes - warm, round, Golden is the symbol of the sun, which is very needed in the winter. Every day of the holiday is of particular importance and is devoted to certain rituals. Every day holiday week carried its own meaning.Monday is Maslenitsa meeting. People create Straw Marena from used burlap, old clothes – a Scarecrow, which symbolizes winter. Meet Marena with songs, then put on a high mountain and starts sledding down the hill. Put the doll on a pole so that you can carry. This effigy had to be taken through the entire village. Then it was carried to the hill. Here the real fun began. Not only children but also adults sliding on a sled, filled with straw bags. Very often riding was supplemented by riding the swings. Takes off the higher the person the better will be the harvest this year. Tuesday begin a variety of entertainment: puppet theatre, clowns, street entertainers act out funny scenes. Often on this day, young people arrange a viewing. In addition to skating with slides, began the presentation. They participated in Maslenitsa Grandfather and Petrushka. Young people dressed in various costumes and walked the streets and sang songs. Wednesday put on the table and invite guests. Wednesday – a tasty day. Began a traditional blini treats. They say that on Wednesday the son-in-law comes to mother-in-law for blinis comes. On this day, mother-in-law in every possible way shows his good attitude to the son-in-law, treats her blinis, which she herself baked. The houses were simple baked blinis with different fillings, cooked jellies, compotes, baked tarts and cakes. Everyone who came to visit, definitely treated. Thursday - the middle of the holiday week and is called spree. From this day, the festivities are held on a larger scale. On Thursday comes the time for playful fisticuffs. To fight was not only against each other, but "wall to wall". Are fist fights and many other competitions. The celebration is accompanied by jumping over bonfires. On Friday honored the newlyweds. All who recently got married, dressed up and went to visit friends, relatives. In out time, it has long been forgotten, but before, special attention was given to the newlyweds, met for the first time Maslenitsa in marriage. They always had a place at the head table and food was offered first to them, not as is usually accepted, in order of seniority. This is the simplest explanation, it was believed that their love can melt and banish any cold. But the singles attitude was exactly the opposite, in some areas they even openly disgrace. For example, tied to the leg or hung on the neck the bars with which they had to walk the whole event. If Wednesday is honoring mother-in-law invited her son-in-law for blinis, and on Friday, according to tradition, the son-in-law invited mother-in-law evening at home with blini. On Saturday, the couple had to receive guests at home. Came those whom they visited the day before. On Saturday, the daughter-in-law spends zolovkina (husband's sister) gatherings . She invites the relatives of the husband. On this day every sister-in-law must present a gift to her sister-in-law. On Sunday during blini week is called "forgiveness day". People to this day asking forgiveness for any wrongs, they visit the cemetery to say goodbye to deceased relatives. Again visited friends, relatives, friends not to feast this day, but to ask forgiveness. Even walked up to complete strangers. And tonight we say goodbye to winter by burning an effigy of Marena. The meaning of Maslenitsa, of course, not only in festivities and fun. In fact, this week is prep before the 40-day fasting. People are spiritually purified, reconciled with each other, ask forgiveness. During this period, not blessed the use of animal food, but still eat dairy products. The holiday of carnival is very versatile, has many meanings and encompasses many traditions and symbols. And everyone will find in it something close to him.